If you're a part of Generation X or a Millennial, there's a good chance that the first mobile game you played was Snake on an old school Nokia phone. Now, you can relive that nostalgia of monochrome and push buttons in augmented reality with the Facebook Camera. HMD Global, the company behind the current iteration of Nokia phones, has developed two augmented reality experiences for Facebook's platform. 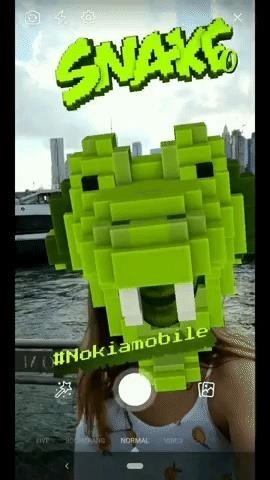 First, there's Snake Mask, which adorns users' faces with a giant pixelated snake mask. 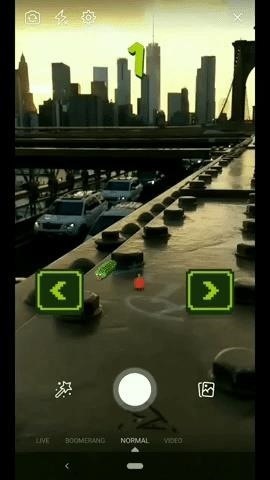 The other AR experience is called Snake Real World, which lets users play the classic game in their physical environment. "Now we launch an even more immersive experience to fans by allowing them to be the snake itself and eat the apples with filters available on Facebook camera — here at HMD Global we are bringing the much-loved gaming icon to a new AR era," said Pekka Rantala, chief marketing officer and executive vice president of HMD Global, in a statement. The company's initial reboot of the game for Facebook Messenger debuted at the annual Mobile World Congress in 2017. It was the first time the game was available on a channel other than a device preload, and it garnered 121 million players worldwide. Given that success, it only makes sense to test the AR waters with the popular game to see if its staying power can be leveraged in the rapidly growing mobile virtual world.